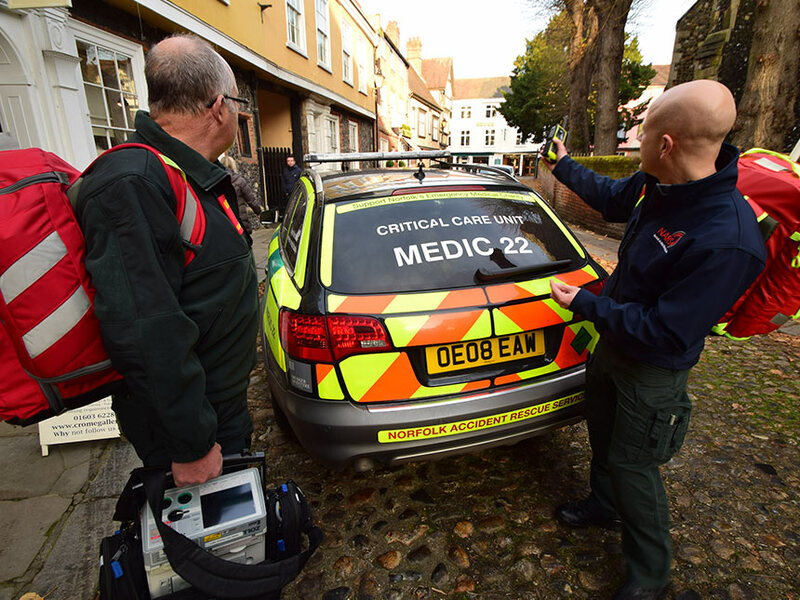 Norfolk Accident Rescue Service (NARS) have been operating since 1970, providing additional support to the ambulance service in Norfolk, improving response times. To find out how you can help NARS with fundraising call us on 07723 647 566. We receive no government funding and as such rely on the kind donations from the people of Norfolk and local businesses, find out how you can help us save lives. 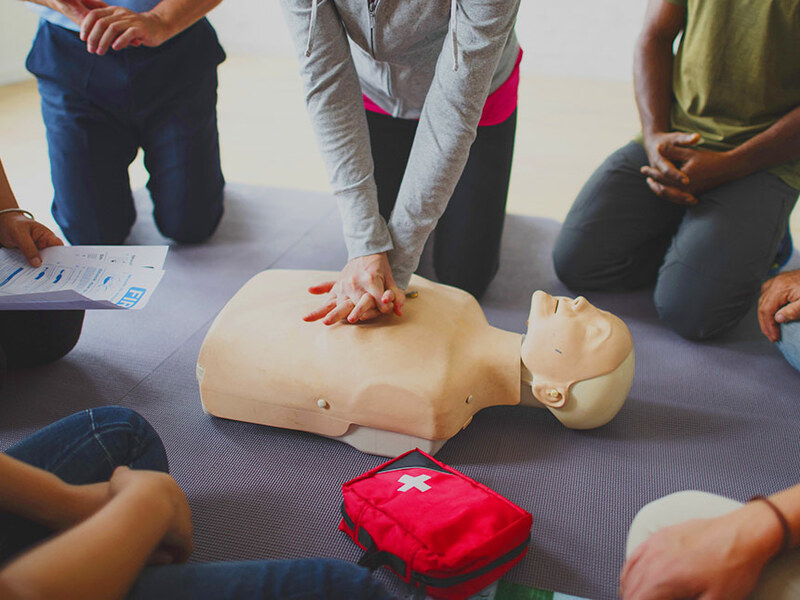 All profits from our training courses go straight into our charitable funds allowing us to continue our work providing greater care to accident casualties across Norfolk. 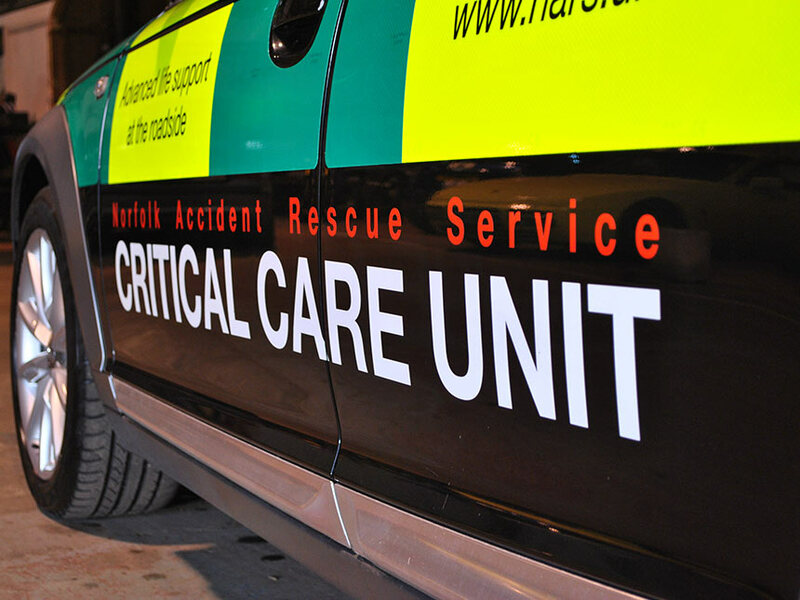 Norfolk Accident Rescue Service (NARS) have been operating since 1970, providing additional support to the ambulance service in Norfolk, improving the level of care provided. NARS volunteers carry specialist equipment designed to cope with the most challenging of medical emergencies. Our colleagues in the ambulance service call upon us to assist in the management of the sickest patients – at home or at the roadside. A new system has been put in place to allow crews to easily escalate and request Critical Care support. If you are a medical professional and would like to give your time as a NARS Volunteer, see our volunteer page for more information. NARS volunteers can provide additional equipment to patients suffering from acute cardiogenic pulmonary oedema. This condition is where the heart fails to pump adequately resulting in a large build-up of fluid inside the lungs, impairing exchange of oxygen and carbon dioxide in the lung. A machine called a ‘Continuous Positive Airway Pressure’ (CPAP) device can help treat this condition in the emergency setting. All NARS members carry disposable CPAP equipment, which has been shown to reduce the number of patients requiring invasive ventilation (with a breathing tube) in the intensive care unit. An asthma attack can be particularly severe and resistant to the standard treatment of nebulisers and steroids provided by paramedics. NARS volunteers carry additional drugs to treat acute severe asthma attacks. Currently Paramedics working at level 1 (The National Standard Paramedic Qualification) can administer certain drugs for pain relief and treatment of convulsions. These include Intravenous Morphine and Paracetamol for pain relief, and Diazepam for treatment of convulsions. For the majority of patients this is perfectly adequate and provides a high standard of care. In certain circumstances patients who are in extreme pain and / or agitation, due to severe injury or are suffering from a medical condition, may require additional pain relief and/or sedation. In these circumstances either a Doctor or Critical Care Paramedic (Level 2) who has had specific Critical Care training and working to specific guidelines, can administer certain drugs to relieve pain and if necessary, sedate a patient. NARS Doctors and Critical Care trained Paramedics can provide this level of care. Referred to as ‘major trauma’, life and limb threatening injuries present a number of challenges to members of the emergency services. NARS volunteers are trained and equipped to perform emergency surgical procedures at the scene of an accident. A surgical cricothyroidotomy is a procedure similar to a tracheostomy in that the lungs can be ventilated in the case of complete airway obstruction, especially in the case of severe facial injuries. Thoracostomies can be performed when a patient is suspected of having severe chest injuries to relieve a tension pneumothorax (collapsed lung). Although children are resilient, trauma is one of the leading causes of death and disability in young children. NARS volunteers are trained in advanced paediatric resuscitation techniques and intraosseous (IO) injection with the EZ-IO system. This enables quick and reliable intravenous access to be obtained in order to give lifesaving drugs and fluids. A range of paediatric airway equipment is also carried. Each NARS volunteer is equipped with a response bag, defibrillator and monitoring equipment. Their cars are equipped with blue lights and sirens and they are trained and assessed by the ambulance service to respond under full emergency driving conditions. Personal protective equipment is mandatory at the scene of an accident, which is why NARS members are provided with high visibility jackets, gloves, safety goggles and a helmet. The East of England Ambulance Service has designated staff in their central control room who look at every 999 emergency call in real-time. NARS members can be contacted any time of the day or night should any of the criteria be met for immediate dispatch. Incidents that trigger an immediate response include Road Traffic Collisions (RTCs), falls from height, cardiac arrests and serious injuries sustained from assault or industrial accidents. The most serious medical emergencies can be harder to determine from the initial 999 call, however in certain circumstances, a call-handler will ask for further information before dispatching NARS.